My first halt is at the Tsitsikamma [a Khoisan word for a “place of many waters”] National Park and the Bloukrans Bridge to witness some of the world’s highest bungee jumping at 216 metres. 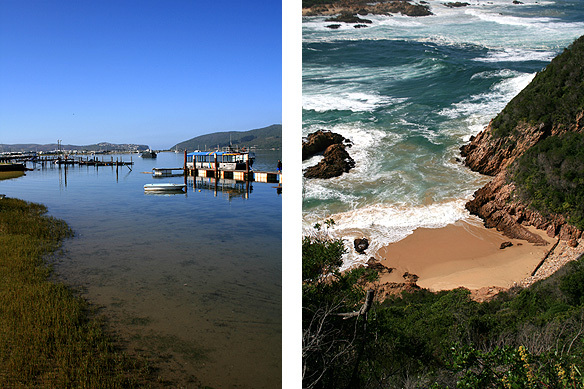 And then on to Plettenberg Bay with its miles of unspoilt beaches and intriguing lagoons. Imagine the bluest of waters, the greenest of forests, and the most golden of sands. Add to this the warmest of smiles and the purest of compassion. And finally, the cherry on the top, of being part of all of this, even if it is merely for one day. I spent today in a town called Knysna on the Garden Route—hiking in the Featherbed Nature Reserve in the morning and playing with kids in a black township in the afternoon. Whilst Featherbed was all about the splendours of nature, the black township I visited in the afternoon was about strength, endurance, love, joy, song, and dance. The visit was also about the story of two women: Penny, a well-to-do “white Zimbabwean” and Ella, a “black farm girl” from the Eastern Cape. These two women have created Emzini Tours, a township tour giving back to the Knysna township through various community programmes, even as it provides an insight into Xhosa culture and township life. I ended up playing with little children in the local pre-school, chatting with Sudanese and Ghanaian shopkeepers and parlour-owners who have made the township their home, and beating the drum to Xhosa chorals. All this while Penny and Ella showed me the soup kitchen and safe house they have set up for battered women, distributed endless packets of sweets to the children, and fed every stray dog on our way. 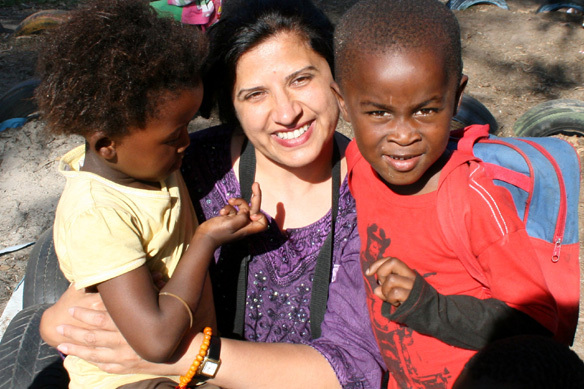 And that’s me with pre-primary schoolchildren in Knysna’s black township. The 20 million-year-old Cango Caves. 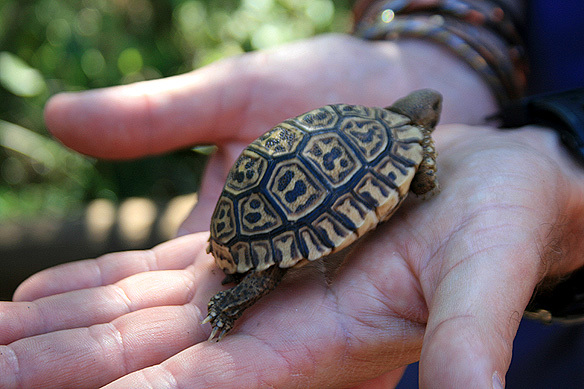 Though the Garden Route is essentially an anthology of forests, lakes, and beaches, a detour via Route 62 to Outdshoorn and the Cango Caves nestled in the dusty plains of the Little Karoo is a big part of the journey. The Cango Caves system, lying in a limestone belt, is the underground wonder of the Little Karoo or Klein Karoo as it is known, with colossal halls and magnificent stalagmites, stalactites, and helictites. 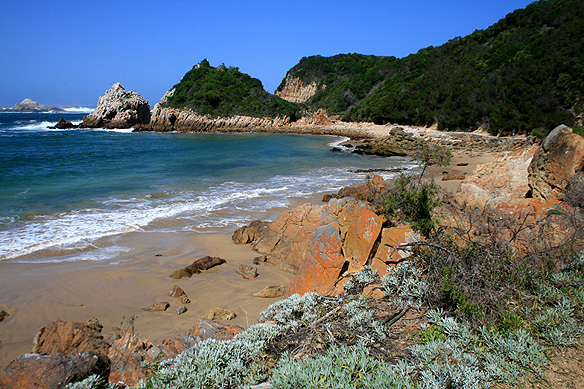 The 20 million-year-old caves were discovered in 1780 and are South Africa’s oldest tourist attraction. 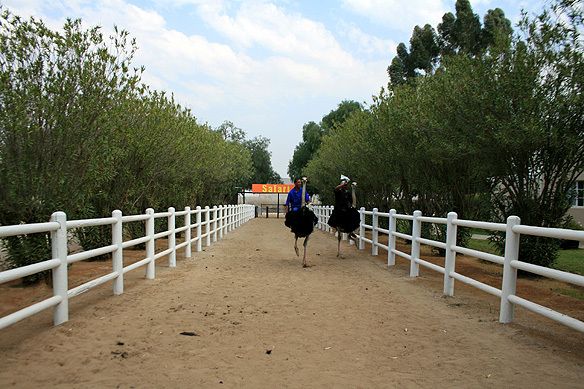 Outdshoorn, on the other hand, is famous for its ostrich population. 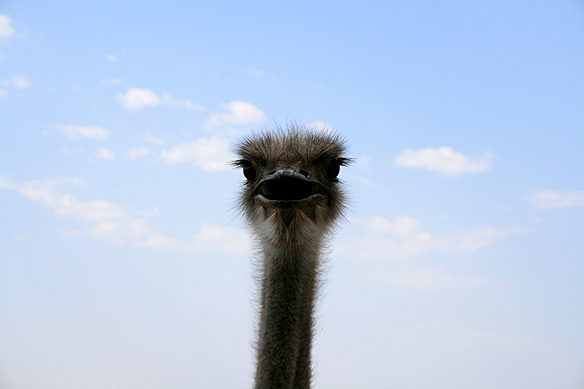 The town has historically been a centre of the global ostrich industry, rising to dizzying heights of prosperity during the two ostrich booms of 1875 – 80 and 1902 – 13. Many of the opulently decadent “feather palaces” in town sprouted during the second period. Outdshoorn [pronounced ohts-hawrn] was then populated by a large Jewish population from Lithuania and was commonly referred to as the Jerusalem of Africa. Lunch appropriately consisted of ostrich meat, ostrich scrambled eggs, and broccoli. I stuck to the broccoli. I may be many things, but brave when it comes to my palate, definitely not! 🙂 Thereafter, it was all about getting to know the ostriches, up close. Did you know that the ostrich is a dinosaur; ostrich skeletons and fossils have been found dating back 120 million years. They are the second fastest animal in the world, able to run at a speed of 70 kilometres per hour for 30 minutes non-stop and have the most advanced immune systems. Interesting. It was by now getting to evening. As I wandered through the town centre, golden light dappled the dressed sandstone buildings while dusty warm winds blew through the thorn trees lining the Victorian streets. A quick dekko in the C.P. Nel Museum revealed the forgotten world of the ostrich boom period painstakingly recreated; the town outside its walls was no less frozen in time. Ostrich racing and portraiture at an ostrich farm. The weather in the cape area is infamously fickle. After days of gorgeous blue skies and wonderful sunshine, it was apparently time for rain. Heavy grey clouds now laced the skies as icy-cold winds and an endless drizzle wrapped me tight. 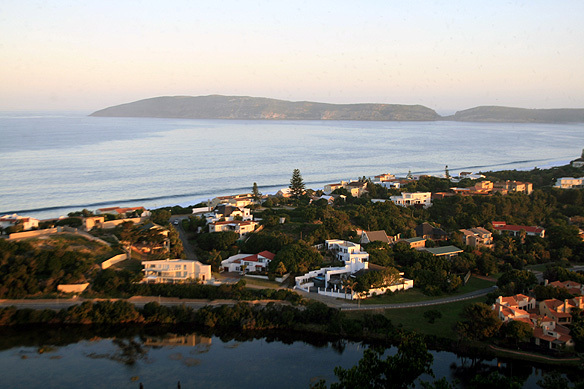 The narrow coastal town of Hermanus offers the best shore-based whale watching in the world when the Southern Right Whales come into its bay. The best time to watch these whales is from August to November. Yes, even when the weather is like today’s. I would have liked to have spent more time here … Walking the cliff paths, watching the whales frolic in the shallow waters, often a mere 20 metres away from where I stood. And with this I came to the end of the Garden Route, a very happy me, chilled to the bone, pretty soaked [I had no raincoat or umbrella on me] and a gigantic smile plastered on my face. Next stop: Cape Town. 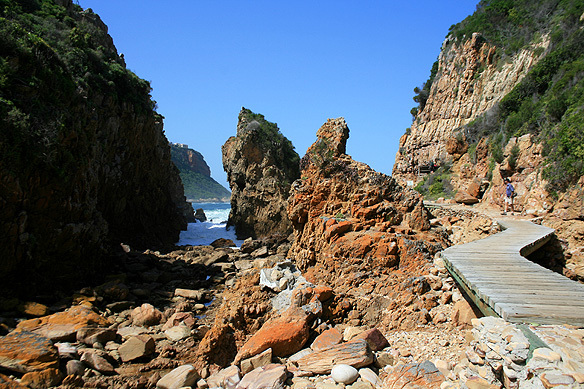 This entry was posted in Exploring our World, South Africa and tagged Adventure Travel, Black Township, Bloukrans Bridge, C.P. Nel Museum, Cango Caves, Emzini Tours, Featherbed Nature Reserve, Garden Route, Hermanus, Jerusalem of Africa, Klein Karoo, Knysna, Little Karoo, Ostrich, Outdshoorn, Plettenberg Bay, Route 62, South Africa, South African Tourism, Things to do in South Africa, Tsitsikamma, Whale Watching by Rama Arya. Bookmark the permalink. Wow. How beautiful is that! 🙂 It is, is it not. Thank you for stopping by and commenting. Wishing you a very happy new year, and a great year ahead. Thank you, Marion. That would be lovely. Hope you enjoy the rest of the series too. some unique experiences that only SA can provide. Didn’t you stay at a vineyard? That also is one of the unique experiences. So beautiful. Were the stalagmites and stalactites in Outdshoorn formed of stone? And will you be posting the rest of your 10 part series? The caves are made of limestone. 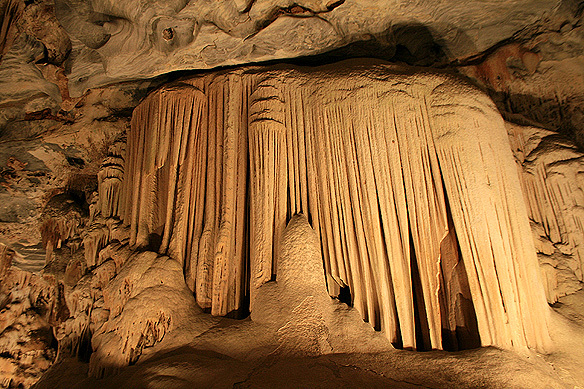 The stalagmites and stalactites are mineral deposits formed as a result of dripping groundwater on them. And yes, I will be re-publishing the rest of the 10-part series. 🙂 This coming Monday, it is Cape Town. Ah thank you! Looking forward to the next posts!